Is education just about knowledge? Join me as I share my thoughts on the deeper value of high quality educational material. "As we begin this lesson, I want to touch on an effective practice principle that i think can be very helpful at this stage. And this is the principle of mental nutrition. Imagine telling someone to come have lunch with you, and they reply “No thanks, I’m ok, I had lunch last week”. That would be ridiculous, right? It is ridiculous because we know that the human body requires nutrition continuously, especially if you do any kind physical exercise. 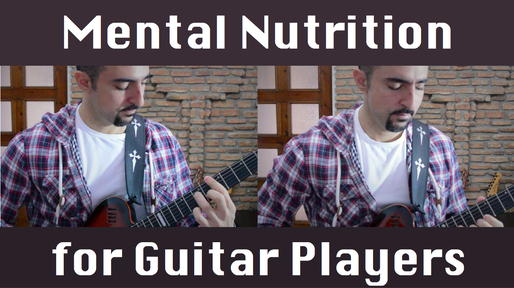 Well many guitar players fail to understand that the same principle applies to the human mind when practicing music (or actually practicing anything). They learn something, they get excited and begin to practice. But as the days pass, practicing usually starts to feel tiring and the excitement can fade away. This is not always a sign of laziness, or lack of discipline. This is many times a sign of lack of proper mental nutrition. You see, viewing a video lesson is not just about getting the information in it. If you just get the information and then try to practice it for days, it’s exactly like having a good meal and then trying to exercise physically for days, just on that one meal. NO. Good books, good video lessons, good learning tools, are not just about information. They inspire you, they excite you, they motivate you, and they energize you so that your practice time is fun and effective. When you decide to watch again a lesson that inspires you, you are not wasting practice time. You are actually investing time that you will get back multiple times because the quality of your practice will be much higher. Many times you will also catch details that you missed the first few times. So I encourage you to appreciate the value of reviewing material. I do it all the time. Believe it or not, many times I even watch my own videos and read my own notes. I study my own stuff! That’s is because this is the way our minds are wired. Even though you may have a revelation and fully understand and learn something new in just a moment of clarity, you still need a certain amount of repetition until it becomes a natural part of your playing, and even then, review will keep you in shape so that your skills don’t start to slip away. Linear Freedom is an effective practice strategy for developing the ability to fluently improvise scalar melodies on the guitar. It starts with a solid technical foundation, but then moves deeper into converting this skill into an intuitive and creative superpower! Click here to check out the LINEAR FREEDOM Improvisation Course. ...So your assignment for this lesson is to come up with a practice plan. Decide what you want to prioritize, how often and for how long you want to do it, and so on. Make sure to include some mental nutrition, video review time to keep you motivated and focused. Remember that any plan is better than no plan. So do it and be flexible to change it up later, as you progress. Always have an investigative approach, keeping your eyes open to discern how you should customize this method. I mean you do get the most of a teacher when you try to follow their instructions with accuracy, but at the same time no teacher can cover every detail of your anatomy, your mentality and your skill level. So be flexible and personalize your practice sessions intelligently. This is the only way to maintain effectiveness. When your sessions start to feel heavy you should change your approach immediately. Practice should be fun! Enjoy your practice and be effective!"